Today, I'm looking at the life and career of character actor Sydney Greenstreet. This article is part of the Fifth Annual What a Character! 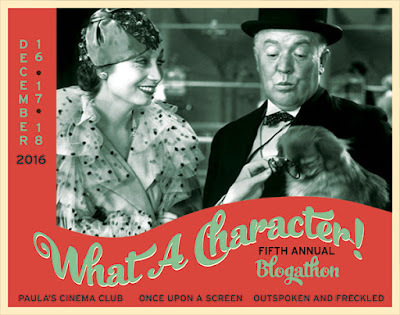 Blogathon hosted by Paula's Cinema Club, Once Upon a Screen, and Outspoken and Freckled. The wonderful character actor Sydney Greenstreet didn't make his film debut until age 61, but he made up for lost time with memorable supporting parts in two of the best movies ever made, The Maltese Falcon (1941) and Casablanca (1943). While Greenstreet most often played villains in films noir, his appearances in 24 pictures include costume dramas, comedies, and one of the most beloved Christmas movies ever made. Today, I'll recommend five great Greenstreet movies, but first here's a little background. 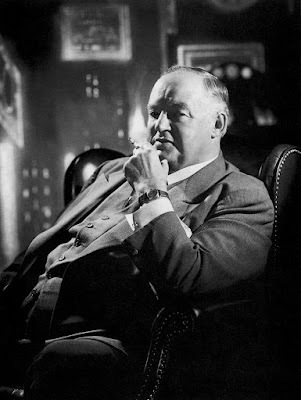 Sydney Hughes Greenstreet was born Dec. 27, 1879, in Sandwich, England, as one of eight children born to tanner John Jarvis Greenstreet and his wife, Ann. Like many young Englishmen of his generation, Greenstreet set off to to the Far East to make his fortune, but after a tea plantation venture in Ceylon (now called Sri Lanka) went bust, he returned to England to operate a brewery. Greenstreet decided to take acting lessons, at first out of sheer boredom with a brewer's life, but his talent combined with his imposing girth and gravelly voice soon led to parts on the British stage. Greenstreet made his theatrical debut in 1902 as murderer in a Sherlock Holmes mystery, and he continued to find steady work in the British theater, appearing in everything from knockabout music hall routines to the works of William Shakespeare. Greenstreet immigrated to the US in the 1920s, where he quickly found work on Broadway. He was wooed by several Hollywood studios after the arrival of sound, but he turned down all those offers to perform with theatrical legends Alfred Lunt and Lynn Fontanne in the prestigious Theater Guild. Greenstreet finally succumbed to the lure of Hollywood in 1940 after a chance meeting with director John Huston, who was making preparations to shoot The Maltese Falcon. Greenstreet perfectly fit writer Dashiell Hammett's description of the villainous Kasper Gutman, aka "The Fat Man" and Greenstreet's memorable performance earned him his only Academy Award nomination. 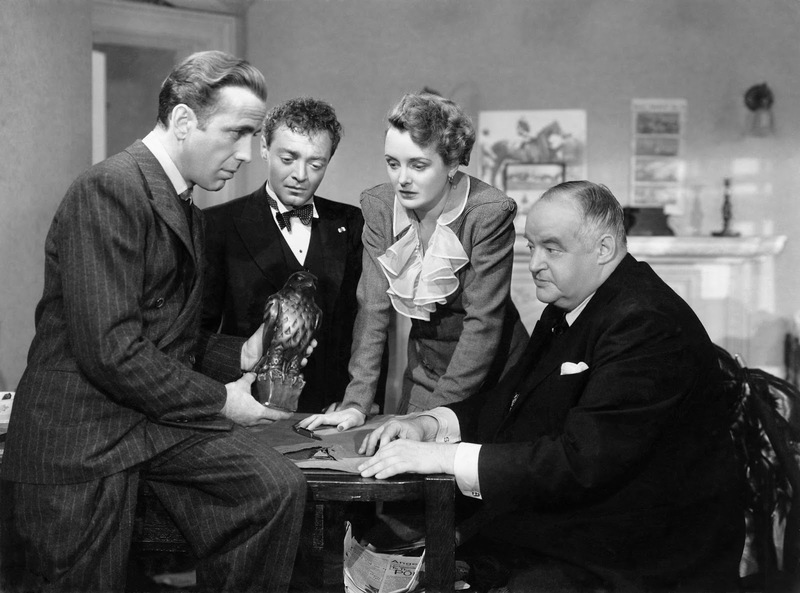 The Maltese Falcon set the template for Greenstreet's career. Although he appeared in a variety of roles throughout the forties -- he played real characters in the costume drama They Died with Their Boots On (1941) and Devotion (1946) and he showed a flair for comedy in Christmas in Connecticut (1945) and Pillow to Post (1945) -- he was most often cast as villains and heavies in Warner Bros. dramas like Casablanca and The Mask of Dimitrios (1944) in which he received top billing along with his frequent co-star Peter Lorre (they appeared in nine films together). Failing health caused Greenstreet to retire from the movies in 1949 after his last film, the World War II drama Malaya, in which he plays a crime boss who helps James Stewart and Spencer Tracy smuggle rubber out of Japanese territory. Greenstreet continued to act on the radio, where he played corpulent detective Nero Wolfe in the NBC radio show (you can listen to an episode here). Greenstreet died from complications of diabetes and Bright's disease on Jan. 18, 1954. He is buried in Forest Lawn Memorial Park in Glendale, Calif. Here's five of Greenstreet's best roles and where you can watch them. The cast of The Maltese Falcon (1941). From left, Humphrey Bogart, Peter Lorre, Mary Astor, and Sydney Greenstreet. Greenstreet was reportedly terrified during the making of his first movie. According to co-star Mary Astor he tearfully implored the actress to hold his hand between takes, but none of this shows up onscreen where Greenstreet gives a performance of masterful menace as "The Fat Man." His chilling giggle and his casual cruelty make him one of old Hollywood's most memorable villains. TCM at 6:15 p.m. Dec. 27 and noon Jan. 7. DVD, Blu-ray, video on demand. 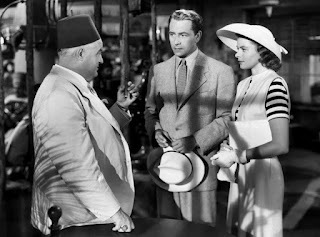 Sydney Greenstreet with Paul Henreid and Ingrid Bergman in Casablanca (1943). Greenstreet has a small, but significant part as the king of Casablanca's black market trade in this World War II drama . He only appears in a few scenes, but his air of quiet menace and his cummerbund and fez ensemble are unforgettable. TCM at 4:30 p.m. Dec. 27 and 8 p.m. Feb. 5. DVD, Blu-ray, video on demand. Peter Lorre and Sydney Greenstreet in a lobby card for The Mask of Dimitrios (1944). This noir about a mystery writer (Lorre) and smuggler (Greenstreet) who are on the trail of arch criminal Dimitrios Makropoulos (a wildly miscast Zachary Scott) doesn't quite reach the heights of The Maltese Falcon, but it is still a lot of fun, with Lorre and Greenstreet careening around Europe like a more menacing version of Laurel and Hardy. DVD, video on demand. Thanks to frequent showings on TCM, this delightful comedy has become a holiday favorite for classic movie fans. Greenstreet is joined by beloved character actors S.Z. Sakall and Una O'Connor for a door-slamming farce about a homemaking columnist (Barbara Stanwyck) who is forced to spend the holidays with her imposing publisher (Greenstreet). TCM at 8 p.m. Dec. 24. Streaming for DirecTV subscribers. DVD, Blu-ray, and video on demand. 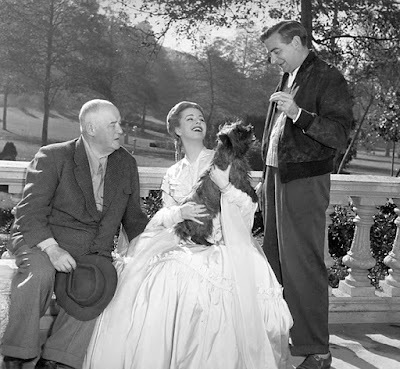 Sydney Greenstreet, Eleanor Parker, and director Peter Godfrey on the set of The Woman in White (1948). Greenstreet's theatrical training made him a natural for costume dramas like Warner's 1948 adaptation of Wilkie Collins suspense novel. 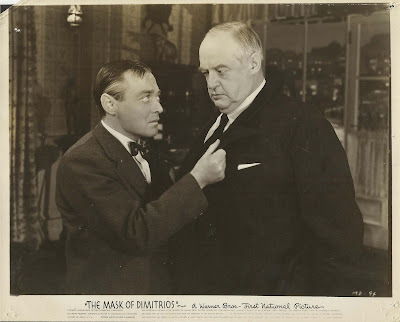 Greenstreet perfectly matches Collins' description of the rotund, chuckling Count Fosco, who is scheming to take away a rich young woman's fortune with her devious fiance (Peter Emery). TCM at 11 a.m. Dec. 27. DVD. I'll leave you with a fun scene in Hollywood Canteen (1944) featuring the dynamic duo of Lorre and Greenstreet. I don't know anyone who doesn't love the work of this unforgettable actor. His voice is one of the greatest gifts of classics. Thank you so much for this thorough and interesting tribute. He's a favorite of mine and I love having him part of the blogathon. Thank you for hosting! His mere presence in a movie makes it a joy to watch. Can't believe he was only in movies for 9 years!! He certainly made an impact though!! I've seen all but Mask of... on your list. Really want to see it though! Such an interesting post!! Sydney Greenstreet is such a pleasure to watch and it must have been fate that steered him to Warners where he could be paired with Peter Lorre. If you haven't seen it I would like to recommend The Velvet Touch. It is a backstage murder mystery and Greenstreet plays a Columbo-like detective. Yes! I haven't seen it. Thanks for the recommendation. I'm afraid I've only seen him in Casablanca and The Maltese Falcon, but Greenstreet is that kind of actor you simply DON'T forget. He had such a presence! You did a great job with that post! Wait... so you're saying you've never seen xmas in Connecticut?!?!? Gasp!!! I will be sure to check your article out. 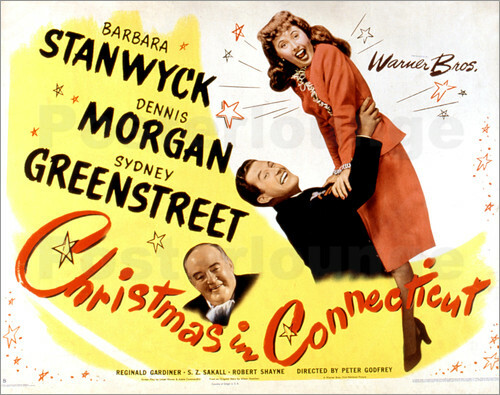 Christmas in Connecticut seems to have become so popular in recent years, probably because it airs all the time on TCM. You never used to hear anything about it. Believe it or not, I didn't even know they had filmed "The Mask of Dimitrios", much less that it had two great stars. I read the Eric Ambler story when I was very young (10 or so), from my grandparents bookshelf. Now I want to see the movie. Dimitrios is a great little flick and my favorite Greenstreet performance. Even more than The Maltese Falcon, it let him run wild: charming, violent, and incredibly threatening. He and Lorre were definitely all time pair. I didn't realize he would get so nervous on set! He certainly had me fooled. Greenstreet is a great performer! He also shows us that it is never too late to start. Also a very good post: I learned quite a bit about his life. A month late to comment, but why does my DirectTV info guide state that he was born in Kenosha, Wisconsin? [Sigh] Harry Houdini comes to mind, who insisted he was born in nearby Appleton, Wisconsin, when in fact he was born in Budapest, Austria-Hungary. Orson Welles was born in Kenosha, though how anyone could get him confused with Sydney Greenstreet is beyond me. Greenstreet is so quintessentially English. Don Ameche was also born in Kenosha. But the viewer's guide makes some howling mistakes.